Published on Friday, December 8, 2017. What do you want for your well-being? For your family and friends? Your neighborhood? Your city, town, or reserve? Across the country, people answered these questions on quilt squares, which volunteers stitched together to create a staggeringly vast 4,000-square-foot modular quilt. 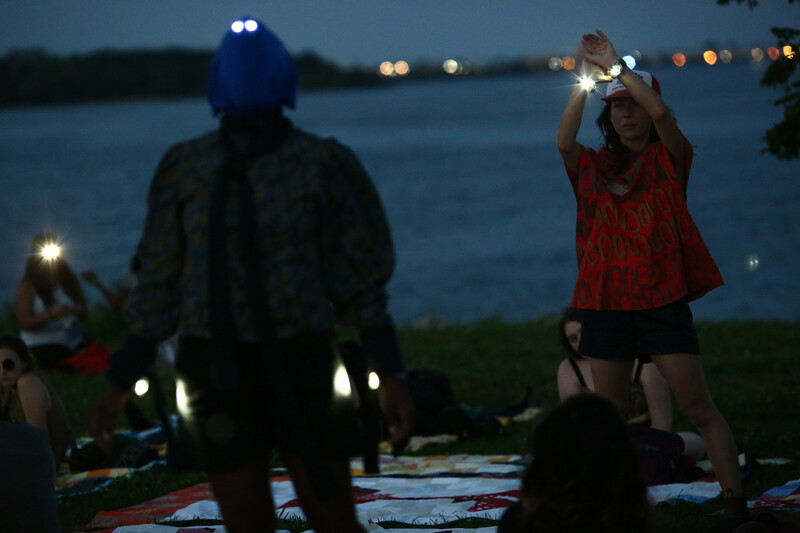 The piece was dreamt up by New York dancer and choreographer Emily Johnson for her all-night, outdoor performance gathering Then a Cunning Voice and A Night We Spend Gazing at Stars, a traveling event that invites strangers to congregate, share a meal, and take in performances and the night sky. Johnson envisioned the quilt as an integral part of the piece, serving as stage, set, and a place for attendees to rest, eat, and eventually sleep. She reached out to Minneapolis fiber artist Maggie Thompson, who runs knitwear line Makwa Studio, to design and execute the piece. Since that time, several project collaborators, including Johnson and Thompson, hosted community sewing bees across the country, and even as far away as Australia and Taiwan, where they asked people what they wish for their communities. “Anytime I traveled to schools or talks and met up with different groups of friends, I brought quilt squares with,” Thompson says. The fiber artist then arranged the squares into patterns, designing 84 quilts that when laid together, cover an astonishing 4,000 square feet. Designing at such a large scale took some ingenuity, but Thompson, a former architecture student, was up for the challenge. “I literally took it to a grid,” she says. To create a strong visual presence, she drew elements from bead working and weaving patterns. At a later date, Indigenous star stories will also be stitched into the back of the work. Although the quilt was a massive undertaking on its own, it was just one component of a greater piece. Then a Cunning Voice was a night of gathering, sharing, slowing down, and caretaking. It was conceived to connect people to each other, to the earth, and to the Native peoples who first occupied the land they lay upon. Fiber artist Maggie Thompson stitches together a section of the 4,000-square-foot quilt she designed. 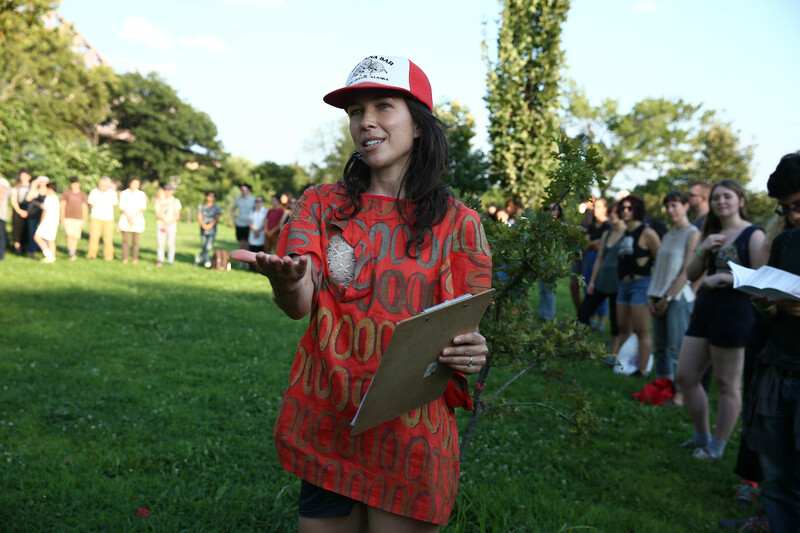 Dancer and choreographer Emily Johnson directs attendees at Then a Cunning Voice. A cross-section of quilt squares, where people wrote down their hopes and dreams for their communities. 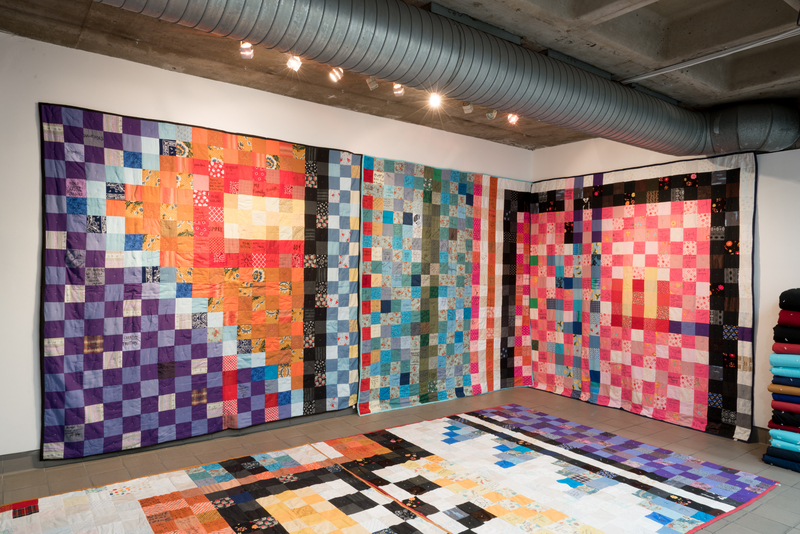 Eighty-four sections of the quilt were exhibited at Abrons Arts Center in New York City last fall. Emily Johnson and a collaborator perform at Then a Cunning Voice. Makwa Studio’s boldly patterned winter wear.